I seriously devoured this book. In one day. I love this series. The first book I liked, the second I liked even more. And this one? I loved it. I'm a little upset by the ending though. I feel like I was all worked up, anxious and desperate to know and then, no. Not going to happen. This has to be one of the worst cliff hanger books ever. I really don't like cliff hangers. No resolution. None. (if this is sounding a bit like a 3 year old rant, that's probably because it is. Well, maybe not so much the 3 year old part, but a rant to be sure.) Do you know how long I have to wait for the next book?! Seriously?! Her name is Sherlock Holmes Baldwin. No, really. But most everyone calls her Sherry. And she really does have a knack for solving mysteries. In this fourth installment of the series, Sherry is headed to Hollywood. Her essay on love has won the grand prize from Hollywood Girl magazine and Sherry has won an all expense paid trip to Hollywood. A dream come true for any thirteen year old. Within a day of arriving, Sherry stumbles upon a mystery. A purse is stolen right out from underneath their noses and the suspects are the same ones who have been burglarizing the homes of young Hollywood celebrities. With the help of Sherry’s best friend Junie, and Leah, a new ghost on the scene, Sherry puts her mind to solving the million dollar mystery. This was a cute book and I really enjoyed reading it. It was fun and light. Sherry is an active, curious character who loves solving mysteries. The story had a good flow to it and made me smile. My favorite line from the book was, “she’s pretty old, like forty.” HA! (while I’m not forty YET, I’m closer to that age if we are rounding!) Sherry sure seemed to have a lot of free reign for a thirteen year old girl, especially in LA where things can get a bit rough. I know I wouldn’t allow my thirteen year old girl to romp through the streets of LA, day and night, unsupervised. This book has a marketed reading level of ages 9-12. 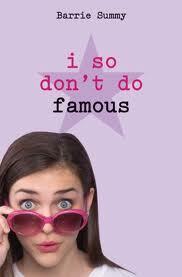 A fun summer read for your tween! 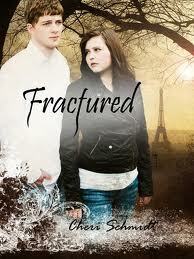 The Fateful Trilogy continues with Fractured. 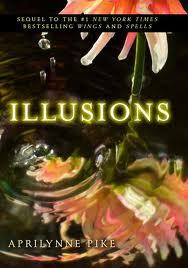 As stated above, this is the second book in this series and is not a stand alone book. You really need to read Fateful before this book. While this was a pretty clean book, it isn’t one I would put into the hands of my 13 year old. There is a lot of sensuality which is, in my opinion, more appropriate for the more mature reader. I congratulate Cheri Schmidt on her success with these books. They are doing very well as far as sales go. You can pick Fateful up at Amazon on the kindle for .99 cents and Fractured for $2.99. Awesome! I listened to this book on my IPOD, it started out being my motivation for exercising, but then I got hurt and I couldn’t exercise. Do you think I was going to wait to finish this book? No way. I started plugging in while I cleaned, drove around (only one ear!) and anytime I could get away with it because I loved listening to this book. Just one small irritation in the character Kate. Small. I didn’t like the way she kept calling Vincent a monster over and over in the beginning. She sometimes got on my nerves just a bit. See? Just a small complaint. Not enough to deter me from loving this book. I felt like I was there in the book with those characters. I loved Vincent. He really held the story together for me. He is strong, steady and yummy. Especially for a dead guy! I loved getting to know his family of revenants. They were all great characters with such a loyalty to each other. The story of the revenants is a good one. I always say I do not like Zombie books, but I think this might just classify as a zombie book. No, really. Now I can say I like a zombie book. J Vincent was the best zombie ever. This book contained some language, (a few hell’s and damn’s and once instance of the B word) and some kissing and sensuality. When Trevor MacDaniel, a high country outfitter, rescues a toddler from the jaws of a mountain lion, he can’t foresee the far-reaching consequences of his action, how it will entwine his life with gifted sculptor, Natalie Reeve—and attract a grim admirer. Drawn by the heroic story of the child’s rescue, a twisted soul sees Trevor as archangel and adversary, and threatens their peaceful mountain community—testing Trevor’s limits by targeting their most helpless and innocent. Wow. I’m still thinking about this book, wondering about it. The main characters were real and touchable, if that makes sense. The struggles were identifiable. Both Trevor and Natalie were great characters and I liked them. I admit to being a bit lost when it came to the “evil” and “darkness”. It was creepy, for sure, especially in the beginning. I’m not sure I completely got the connection from what I read throughout the book of the “darkness” and what it turned out to be in the end. In the beginning, the “darkness” says, “what use is darkness if not to try the light?” He sure didn’t come across in the beginning as a grim admirer. He came across as evil and possessed. Somewhere along the way it shifted to grim admirer, someone who was looking for help, but so much along the way gave you a totally different impression. It was sometimes confusing. I really enjoyed the progression of the plot, the desire to know pushing me forward. I wanted to understand what was happening with the antagonist. I guess it was the ending that left me wondering. What happened to the dark being? How about the loss of the gift for the main character? Does she continue with her art? 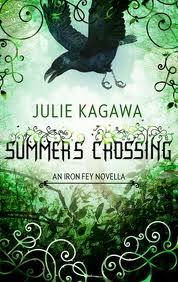 There were so many characters in this book, and I think not having read the first book hindered me a bit in that area. I did get a feel for a previous story, but didn’t have that connection to those characters. I’d like to go back and read Indivisible. Overall, this was a good read. 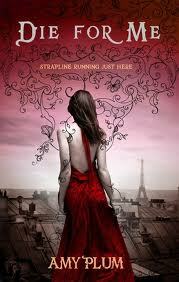 I enjoyed the writing style and the tension in the book. I received this book courtesy of Blogging For Books for my honest review. My most sincere thanks to Lisa Bergren for generously allowing this giveaway. And thanks to everyone who took part in making the giveaway great. The winner is Krystal who random.org kindly picked. :) Congrats to Krystal! Last Day for Cascade Giveaway! 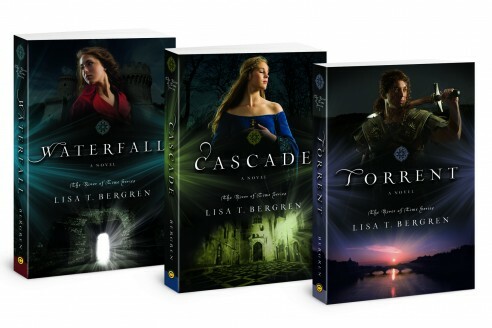 Just a reminder that today is the last day to enter my giveaway for Cascade by Lisa Bergren! This is an awesome time travelling, adventurous romance you don't want to miss. Well, I don't really have a favorite genre. I'm sort of a moody reader, so sometimes I'm really in the mood for a good romance. Or sometimes I want a good action book. I love chick lit and sometimes I enjoy a good mystery. I love westerns and well, paranormal and dystopian. How can I pick just one?! I can't. Give me a good book in almost any genre and I'm a happy girl. Some of my favorite reads so far this year? *my giveaway for this book ends tomorrow so check it out! I really enjoyed the Iron Fey books. How exciting to have this novella insight into Puck and his head. :) I love Puck. And the cover here? Gorgeous, just like the rest of them. I have to admit that I sort of feel like I was deprived with this novella. Novella = Short. The rest of the books were long and filling yet still left me wanting more. This novella was like having the first bite and then having it taken away. Still wanting it all. Do you know what I'm saying? Sigh. The one bite was sure good though. This was a nice, easy historical romance. I wouldn't classify it among my personal favorites, but it was an okay read. I honestly felt like the the story had so many parts of the plot that didn't really get developed like I wanted them to. Connecting with the characters emotionally didn't happen for me. While I liked them, and I liked what they were about, I never did fully connect with them. I went to a book festival a couple hours from where I live yesterday. It was awesome. I met some great authors, got some of my books signed and ran into some cool people in the process. We own every one of Brandon Mull's books. My kids love his Fablehaven series. I took our book of Candy Shop Wars to this event though. Most of the people in line had his newest book, Beyonders, with them. It was great to meet him. I've heard Brandon Mull speak and he is very entertaining as well. Here I am with Aprilynne Pike. Awesome! I haven't read her last book, Illusions yet, but it's in the pile. She is so cute, isn't she? I had to steal this book away from my daughter to take with me. The Forgotten Locket is the last book in the Hourglass Door Trilogy by Lisa Mangum. She is such a nice lady. I've really enjoyed reading her books and it was exciting to meet her. 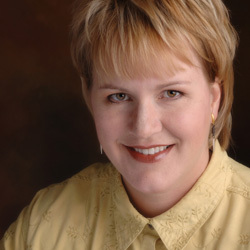 Interview with Author Lisa Bergren and a GIVEAWAY! I recently reviewed here on my blog the first two books in the River of Time Series by Lisa Bergren. I loved them and I'll tell you why. They were well written, fast paced and had everything I look for in a great book. Action, romance, history and strong characters. What I loved even more was that once I was finished with these books, I was able to hand them right off to my 13 year old daughter with no worries. Lots of times I read books and really enjoy them but I don't let her read them because they contain something inappropriate for a young teenage reader. I love that this is a series I can share with her. Welcome Lisa. I'm so glad you are here. I love to travel. I haven't been many places but I dream of going all over this earth. I know you love to travel too. Where is the most memorable place you have been? Is it a cop-out to say Italy? Truly. Been three times and can't WAIT to return. (I'm heading there in October with Daughter #2.) But Israel and Egypt were equally memorable. You have written many different kinds of books. Fiction, non-fiction, children's books... Have you always wanted to be a writer? Which genre do you love writing the best? Wow, I'm ADORING YA. Never even considered it until my daughters were teens (they're now 16 and 13). But I love this age for a heroine--all of life, poised, ready, before you... And yes, I think I always wanted to be a writer. But I didn't dare to think it was truly possible. It wasn't until my 5th or 6th book was out that I could utter the words, "I'm a writer." "Author" seemed too pretentious! You mention on your website that one of your daughters was a reluctant reader and that you wrote the River of Time Series for her. Did she have any input in your stories and characters? She didn't have any input up front, but she had plenty, once the book was written. She was my first reader, telling me if I was off on how teens said things, thought, etc. And when she loved it, I knew I was onto something special. I was impressed with the amount of research you did for these books. Do you enjoy that part of writing? I really do love research. Historical fact always brings up unique turning points for my plot. What made you choose the fourteenth century as the time period for your books? Pre-Renaissance, Pre-Reformation...it was an innocent, but powerful age of change, potential. I think it's a perfect setting for a "coming of age" series for two young women. A trilogy on a group of young people, children of the copper kings, setting out on the Grand Tour of Europe in 1914. 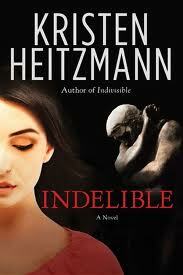 I'm loving it, too...The first, TO HAVE AND TO HOLD, comes out Summer 2012. Thank you, Lisa for taking time to answer some questions! Now on to the giveaway! Here's what you need to do. Watch the following trailer for Cascade and leave a comment here telling us what you liked about it. Don't forget to include your email address so I can get in touch with you if you win. If you want an extra entry, comment on either review I wrote for Waterfall or Cascade and leave another, separate comment letting me know where you commented. Giveaway ends Friday, June 17th. Ty has spent his whole life living underwater. His parents own land and farm there as part of the government’s new Subsea Homestead Act. Global warming has forced people above ground to move closer together as land disappears into the depths of the ocean. And a select few have determined to make a new life underwater. 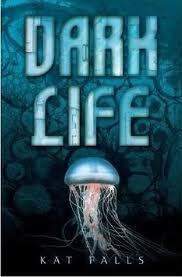 Living deep under sea is the only way of life Ty knows and when outlaws attack his homestead he is determined to fight back to protect his home, his family and his future. Gemma has spent her life crammed together in the same living space as many other people. Her one and only goal is to escaped and find her brother who she hasn’t seen in years. Her search takes her deep under the ocean to a world she has only heard stories about. It is much more beautiful and terrifying then she ever imagined. I first saw this book in my daughter’s book order from school. I thought it looked good so I decided to pick it up. Then I read a really positive review for it and I bumped it up on my to-read pile. This dystopian JF adventure was very interesting. I really enjoyed imagining an underwater world where people can be self-sufficient. There is much talk about Global Warming and other atmospheric and weather changes on our planet. This book made me really think about what it would be like if something like that did happen. Could the whole east coast just fall into the ocean? Could the ocean really rise enough to cover our country? Hum... I wonder if I would be brave enough to be the pioneer into the ocean to try to make a new life there. I seriously doubt it. Even if I could swim with dolphins and hang out with whales. It's all those other scary things out there...yikers! I really liked Ty's character. I really liked his family too. It seemed like they were a real family, dealing the best they knew how. Ty has some special abilities that make him different from other people. He tries to hide that because he's afraid of what people will think and how people will treat him if they know. While most of us don't have sonar abilities like Ty, I think many times we struggle against being "different", afraid of what people might think or say about us. I think this is what helped me really relate to Ty and feel with him. Gemma was one determined girl. Her bravery and strength came from her deep desire to find her brother. She remembered the love he showed to her and wanted that again. I like Gemma's loyalty. She was a great character too. This book had lots of fun adventure and moved along quickly. I really enjoyed it and I am anxious to pick up the next book in the series called Rip Tide that comes out in August. This is a JF book, suggested reading level of grades 6-10, which I thought was spot on. There was one use of "like hell" in it. Wow, thank you to everyone who entered my giveaway! You guys are the best. I commented on your "DIVERGENT" review! I want to read that book SO BAD! Congrats to you! I'm sending you an email now!